This is in continuation to yesterday's blog post: linky-do. I decided to do it in parts as otherwise it would be miles long. Yes, I highlighted where it stated 20 Children (Which would equal 20 iPads). Soon, they had reach enough funds for 1 iPad, that A4CWSN said that they would double, and they suddenly had enough for 2 iPads! Yah! 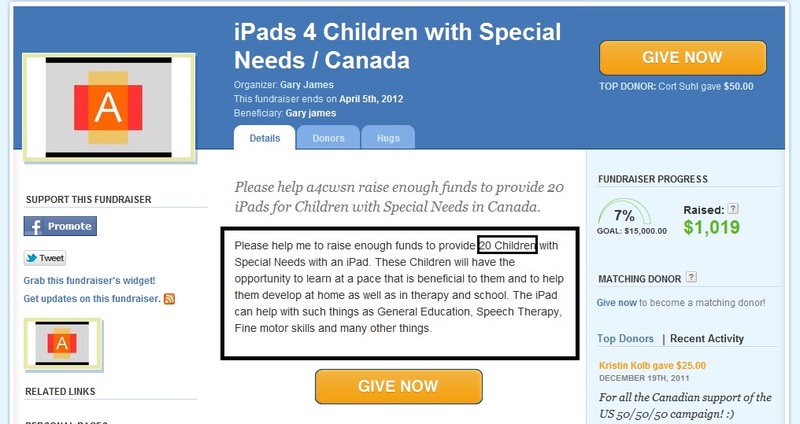 Shouldn't he say... they're now at *3* iPads, because uh, am I not mistaken or did he not say that he was matching the funds? 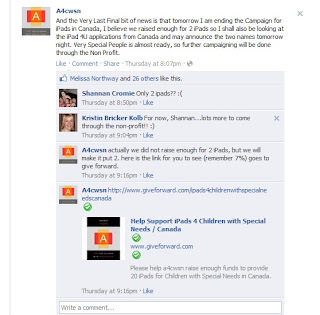 And, now, suddenly, the 20 iPad campaign for Canada is abruptly being ended, before it's even really begun? So, not only do us Canadians get the shaft from A4CWSN by means of NOT having a campaign here (and hey, ya, I'm offended, I'm a Canadian EH!) , but A4CWSN doesn't feel he needs to keep his promises to us, either. 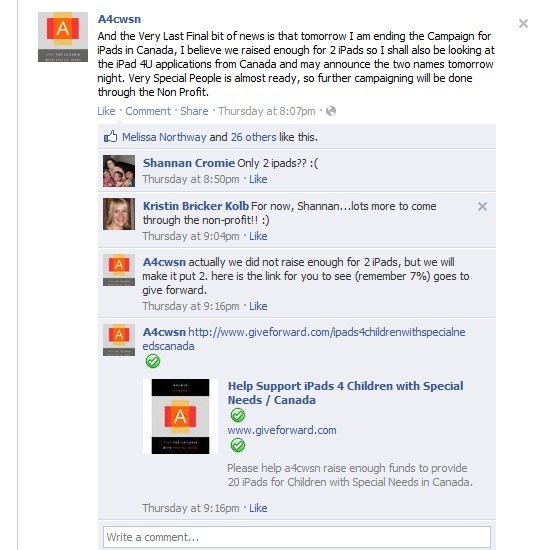 Oh, ps, he never did announce the Canadian iPad winners before taking off from Facebook and Twitter, either. 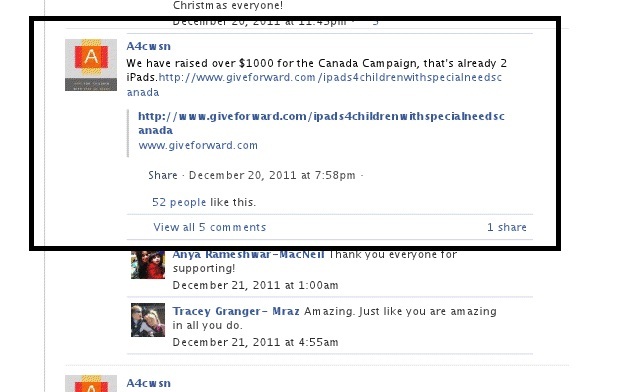 ugh...he never did announce the name of the child he was giving the Ipad to that the husband(with end stage cancer) and wife donated and shipped directly to him a week before Christmas. He just said that he feels it was only fitting that a child who has cancer be the recipient. Did it even get to a child? He is an awful awful man! So, wait, what? What was the total raised? The figure above of $1,000? You are saying that money wasn't spent on iPads? Not even 1?! What does that lawyer friend of his (Kolb?) have to say about this? I see she commented "lots more to come" so she must know something. I totally missed this one. Whatever was raised on giveforward and whatever was sent to his paypal. 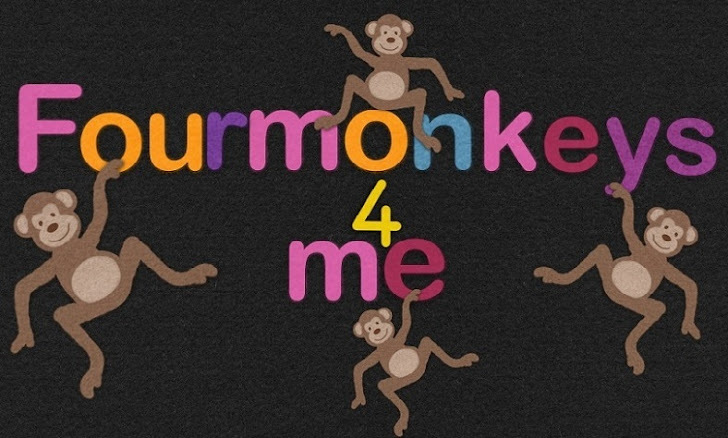 There have been NO iPads given from this campaign at this point in time. Man he likes to send money all over doesn't he....when the feds/state unravels this they will have fun! The Canada Campaign is showing that it is still open on give forward and has raised $1019. 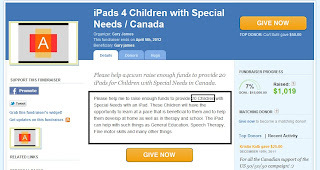 Truth Seeker, An iPad purchased from apple with tax is $530.69 (going to CT) with the 7% give forward fee a total of $1140.87 would be needed for 2 iPads so yes the campaign was short by about $120 but Gary had also stated he was matching so there still should have been 2 iPad's. Additionally, if he was doing the math why would he say he was closing the campaigne before getting the extra $120. If he intended to keep some of the money for his "efforts in raising the money" this should have been stated up front so people know what they are giving towards. And right before Christmas, he had people sending in thier rewards certificates from Best Buy that was suppose to be towards getting an iPad to a military family with a special needs kid. I don't remember anything coming from those either. What was the total dollar amount received inside the Christmas cards sent directly to his home? Is there any way to verify what he said was sent in those cards? Thank you. Did he mention it on the video he made picking the winner? Unfortunately, no way to verify the amount of CASH that he solicited ILLEGALLY through the mail. I have NO doubt it was more than he says though. I personally saw people posting that they had added extra ($5,$10,$20) and it doesn't add up to what he said. he mention just under $500. He recieved 400+ cards. And don't forget about the Roger Waters autographed guitar (valued at about $2,000) that was donated to A4 and was going to be auctioned as a fundraiser. Where is the guitar now? Wow! If he illegally solicited and it was sent in the mail, then that counts as mail fraud! (possibly international mail fraud)! The Canada Campaign and the Australian Campaign are BOTH suddenly closing tomorrow!!! Thank you for bringing up the Canada question. I, too, question what happened to the - "I will personally double whatever we bring in in the first 24 hours." I don't see that accounted for anywhere and it was well over $600 that was raised within the first 24 hours. Then the iPad last night goes to the only real person who put any effort into their post. I am to saing she is not deserving but where is the fairness - who decided she to it, why were there no other 'substantial' entries, why wasn't it posted for more than 2-3 hours? Weren't there supposed to be concert tickets too? What an awful , awful man disgusting ! !